NASA Apollo 11 Service Manual From Haynes | OhGizmo! Could A Laser Oven Be In Our Future? Pew Pew! If your timing is right, it’s not hard to pick up a used lunar module from the Apollo era on eBay or Craigslist for a steal, but what really kills your budget is when you have to take in to NASA for repairs or a tune-up. Those rocket scientists don’t work for peanuts. 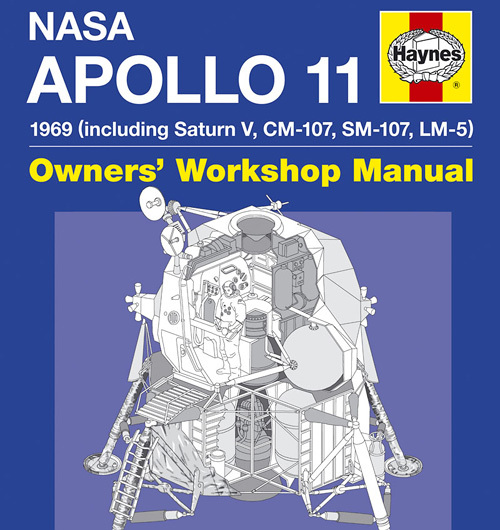 So if you’re the DIY type, you’ll be happy to know that Haynes has an Apollo 11 manual circa 1969 that also covers the Saturn V, the CM-107 Command Module, the SM-107 Service Module and the LM-5 Lunar Module. Basically everything you’ll need if you’ve been considering a trip to the moon, including launch procedures, how to moon walk and dealing with that tricky Earth re-entry procedure. You can order your copy directly from Haynesonline for about $29.